Travelty Responsive Travel Blogger Template is a blogger template designed and developed for travel bloggers. But its simple and clean design can be used for any kind of blog like Food blog, Lifestyle Blog, Photography Blog, Cake Blog, Travel blog, Parenting/Mom’s blog, Health, Fitness and Gym, Personal Blog, Fashion Blog, Yoga Blog, Pets Blog, Car mag, Game Mag, Tech Mag and many more.! 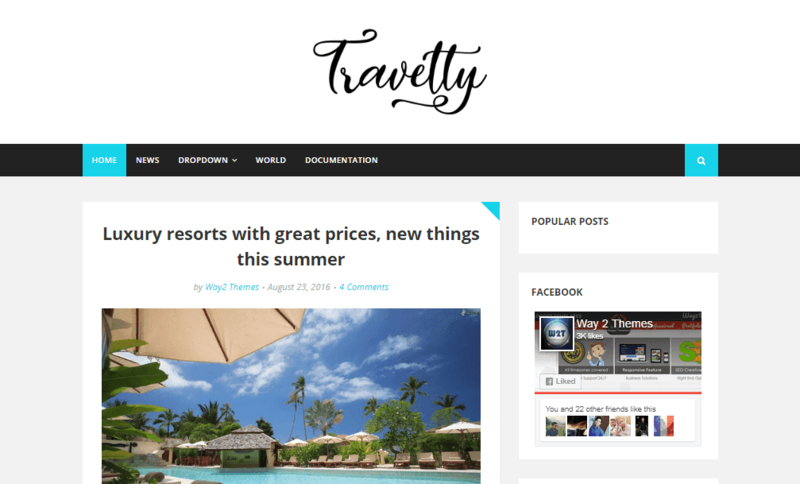 Following are some of the key features of Travelty blogger template. 100% Pure Responsive - CHECK SEO Ready - 100% Google Validation - CHECK Mobile Friendly - CHECK Loading Speed - CHECK Error Page - CHECK Detailed Documentation - CHECK Read More With Thumbnail Custom Popular Post Widget Minimal & Clean Design Customized Comment Widget Multi Dropdown 2 Featured Widget Stylish Social Widget Related Post More Awesome Features. Black, White and sky blue which can be customized later through blogger template customizer. Seo Ready, Browser Compatibility, Responsive, Adapted From WordPress, Social Bookmark Ready, Post Thumbnails, Ads Ready, Drop Down Menu, White, Black, Green, Travel, Elegant, Girly, Simple, 2 Columns, Email Subscription Widget Ready, WhatsApp Sharing, Fast Loading, 3 Columns Footer, 1 Right Sidebar.